Pine nuts have been eaten in Europe and Asia since the Paleolithic period. They are frequently added to meat, fish, salads and vegetable dishes or baked into bread. In Italian they are called pinoli (in the U.S. they are often called "pignoli" but in Italy "pignolo" is actually a word far more commonly used to describe a fussy, overly fastidious or extremely meticulous person) and are an essential component of Italian pesto sauce, and the upsurge in the popularity of this sauce over the last 20 years has increased the visibility of the nut in America, primarily on the West Coast. Pignoli cookies, an Italian American specialty confection (in Italy these would be called "biscotti ai pinoli"), are made of almond flour formed into a dough similar to that of a macaroon and then topped with pine nuts. In Spain, a sweet is made of small marzipan balls covered with pine nuts, painted with egg and lightly cooked. 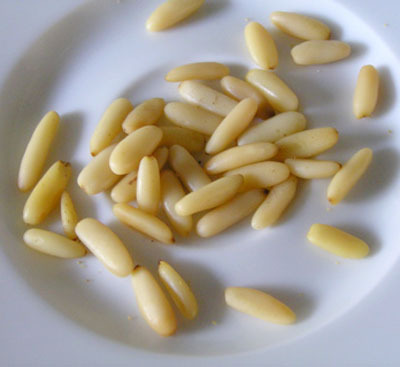 Pine nuts are also featured in the salade landaise of southwestern France. Pine nut coffee, known as piñón (Spanish for pine nut), is a speciality found in the southwest United States, especially New Mexico, and is typically a dark roast coffee having a deep, nutty flavour; roasted and lightly salted pine nuts can often be found sold on the side of the road in cities across New Mexico to be used for this purpose, as well as a snack. The Nevada, or Great Basin, pine nut has a sweet fruity flavor and is relished for its large size, sweet flavor and ease of peeling. Pine nuts are also widely used in Middle Eastern cuisine, reflected in a diverse range of dishes such as kibbeh, sambusak, desserts such as baklava, and many others. Throughout Europe and Middle East the pine nuts used are from Pinus pinea (Stone Pine)[dubious – discuss]. They are easily distinguished from the Asian pine nuts by their more slender shape and more homogeneous flesh. Due to the lower price, Asian pine nuts are also often used, especially in cheaper preparations. 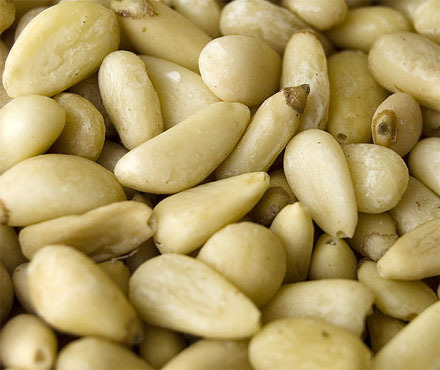 Pine nuts contain thiamine (vitamin B1) and protein.